Father Francis Rosario, who is helping to organize the Bengali Catholic community in the diocese, is shown with men and women from the ministry at Queen of Angels Church, Sunnyside, where Christmas was celebrated in the Bengali language. The celebration of Christmas for the local Bengali Catholic community was unique this year. A Mass of thanksgiving in Bengali was celebrated at Queen of Angels Church, Sunnyside. 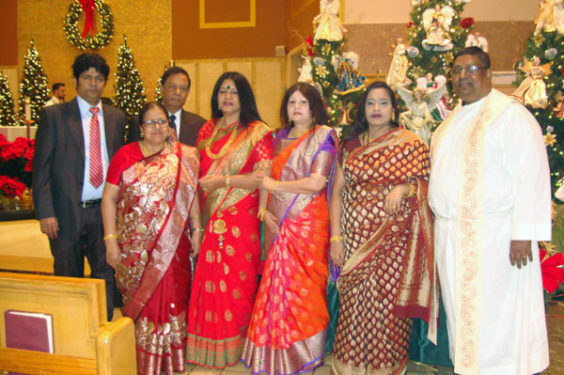 Even though the Bengali Catholic community gradually settled in the U.S. more than four decades ago, they have been like a pilgrim people who tried to find their own identity in a vast ocean of various immigrant communities. The majority of the Bengali Catholic community are from Bangladesh, and a few families migrated here from India. The Diocese of Brooklyn recently opened new opportunities for the community to be included into the mainstream Church Apostolate. Bishop Nicholas DiMarzio appointed Father Francis S. Rosario, a Bengali priest from Kolkata, West Bengal, to coordinate outreach to the local people. He serves as parochial vicar at St. Bartholomew, Elmhurst, and Queen of Angels, with residence at Queen of Angels. His pastoral ministry to the Bengali Apostolate in the diocese is under the guidance of Father Brian Dowd, pastor of Queen of Angels and Father Rick Beuther, pastor of St. Bartholomew. This year’s Christmas celebration in Bengali was one of the first initiatives to gather the people from similar background. The traditional Bengali Christmas hymns and carols were sung by a small group, who had come for regular practices in the church. A sizable number of Bengali faithful, who are settled in Queens, particularly in Jamaica and Elmhurst, as well as on Long Island attended the liturgy with Father Rosario as the main celebrant. At the end of the Mass, the members of the community paid their homage to the Child Jesus in the manger. Afterwards, there was a sharing of cake and cookies, and an exchange of Christmas greetings. There was much joy among the members of this small community. They felt deeply God’s love on this Christmas night that their hope for a better future will certainly be realized in the days ahead.